There's a reason why the term "spoiler alert" has become a part of our vernacular. It's because spoilers are everywhere, especially on the internet. People will discuss movies and shows assuming that everyone has seem them and ruin surprises left and right. Legitimate media outlets do this as well, and it's gotten to where I skim Entertainment Weekly very carefully. The worst culprits these days are often trailers. In an attempt to make movies more appealing, the studios will show nearly the entire film in the previews. Sometimes even a seemingly conservative trailer can give away too much. When I saw the trailer for Goodnight Mommy, I had a pretty good idea that I knew what the film's "twist" was. However, I approached it with an open mind hoping to find something more. Elias (Elias Schwarz) and Lukas (Lukas Schwarz) are young brothers who are seemingly living alone in a large house which sits by itself in the country. Their Mother (Susanne Wuest) arrives home from the hospital, her face covered in bandages. There is an immediate tension within this trio, as the boys love to run in and out of the house, exploring the area and bringing home treasures, and Mother is concerned of foreign objects causing an infection. As this battle of wills escalates, the boys begin to become very suspicious of the woman in the bandages. Basically unsupervised, Elias and Lukas begin to lose their grip on reality and a savagery is released. If the above synopsis seems a bit lean, that's because there's not a lot of story happening in Goodnight Mommy. We are given a very basic premise and only three primary characters. (Others do appear, but only briefly.) Beyond that, the film exists essentially for the two mysteries to be solved -- what's up with these kids and who is that behind the bandages? OK, let's explore that first one. I'm going to be somewhat cryptic here, as I don't want to spoil anything for those who decide to check out the movie. Yes, there is something up with Elias and Lukas and if you didn't figure it out from the trailer, as I did, you should be able to discern it during the first few minutes of the movie, assuming that you've ever seen a movie before. The twist here is so obvious that I began to wonder if filmmakers Severin Fiala and Veronika Franz are actually trying to hide anything here. The "secret" is very cliched and there have been many other movies -- which I won't name -- which have successfully hidden the reveal. The staging in Goodnight Mommy makes everything so obvious that astute viewers are simply left to wait for the movie to tell us what we already know. And when it finally does arrive, the twist is revealed in a very mundane manner. As for the mystery surrounding Mother, the movie can't decide what it wants to do with that. When this idea is introduced, it's actually intriguing, and then Goodnight Mommy seemingly decides that it isn't important. A more competent film would leave the viewer in the dark (of course, that ship had already sailed) and we would be left to wonder whether or not we are dealing with paranoia. Instead, the movie wanders away from this and becomes a very standard hostage thriller, delving into shades of Misery. Fiala and Franz are making their feature-length directorial debuts here and they have made the mistake of choosing style over substance. There's no doubt that there are some interesting things happening with the production design here. The house features some odd blurred photos of Mother, which keep her true look a mystery to us. The wire dress-maker's dummy in her bedroom signifies the hollow, vapid attitude of this woman. There's also the truly bizarre scene in which Mother goes into the forest. These elements of the movie are visually striking, but they do very little to help the film. Goodnight Mommy is being praised by some, but I'm not sure what for. (This is probably another case of critics who normally avoid this type of film falling over themselves to hail something which genre fans have seen many times in the past.) The story is highly derivative and shockingly unoriginal. Again, if you don't figure out most of what is happening in the first act, then shame on you. This leads to a very tedious movie, which is quite repetitive and dull at times. By the time that the finale arrives, most will no longer care. The movie does offer fine acting by the three leads and it has a slick look, but the lack of an engaging story ruins everything. Europe is certainly capable of making original, creepy thrillers, but Goodnight Mommy may just put you to sleep. 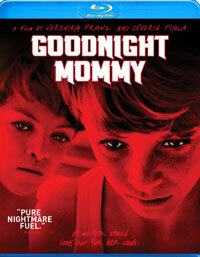 Goodnight Mommy will not be well-received by the ASPCA on Blu-ray Disc courtesy of Anchor Bay Entertainment. The film has been letterboxed at 2:35:1 and the Disc contains an AVC 1080p HD transfer which runs at an average of 25 Mbps. The image is very sharp and clear, showing no overt grain and defects from the source materials. The colors look very good, although there aren't many bold tones here, and the image is never overly dark or bright. The depth is notably good, as is the level of detail. The Disc carries a DTS-HD Master Audio 5.1 track which runs at 48 kHz and an average of 4.0 Mbps. The track provides clear dialogue and sound effects. This is a very subtle track, but we do get some nice stereo and surround effects, most of which define noises coming from around the house. The finale provides some notable subwoofer and surround effects. The only bonus feature on the Goodnight Mommy Blu-ray Disc "A Converation with Filmmakers Veronika Franz & Severin Fiala" (13 minutes). Here, the duo, speaking in German, discuss the influences for the film, the movie's themes, how the script evolved, their views on horror, and the reaction to the film.